his offer, and Peanut became the newest addition to our family. Peanut had intestinal issues that were kept under control with daily oral medications. However, he was uncomfortable in his new surroundings. 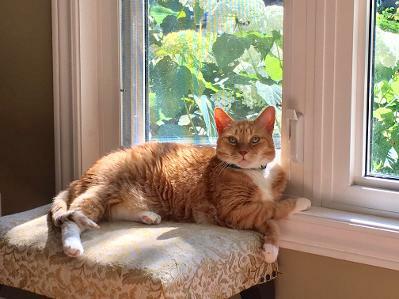 He took up his position on the stool in front of the living room window, quietly watching our every move. He clearly didn't trust us, and preferred to be left alone. As Peanut became more comfortable in his new home, he began to warm up to Charles and I. Every morning he would wait patiently for his ''chew,'' one of the medications that treated his abdominal problem. He seemed to understand that at eight years of age, he had finally found his forever home. Peanut loved to chase a piece of string. Charlie would hold it, run up the stairs, with Peanut close behind. While holding it firmly in his hand, he allowed Peanut to ''attack'' the string. Peanut was very pleased with himself that he had caught his prey. The game would continue, and Peanut once again became the hunter!! Peanut still preferred his stool in front of the window, but instead of watching us, he was now on the lookout for birds, squirrels, and anything else that moved. He gradually started to follow Charlie upstairs, and jump onto his lap. He would spend the better part of the evening there, and would then head back to his favourite stool. As time went on, Peanut began to feel safe, secure, and loved. And, he was beginning to show love in his own special way; he had accepted us. Peanut taught me the importance of trust. Initially, he was apprehensive and doubtful of his new surroundings. At times, I was uncertain as to whether he would ever adjust, but our love for him gave him the confidence that he so desperately needed to enable him to place his trust in us. Peanut loved his food. So much so, that he began to put on a few extra pounds, and we had to curtail his daily intake. By the summer of 2017, his appetite had tapered off. His food was often left untouched, and he was refusing the chews that he had loved so much. Peanut was suffering from an enlarged colon caused by severe constipation. It soon became evident that he needed the medical attention that we were unable to provide. We took Peanut to Creditview where Dr. Saldanha would monitor him for a period of time. X-rays showed that the colon remained enlarged, causing Peanut great discomfort and distress. A procedure to clear the colon was unsuccessful, as were various medications. We visited Peanut several times, but knew that the seriousness of his condition meant that bringing him home was not possible. that we abandoned our sweet little man. But, I know that for the short time. Peanut was with us, he was happy and content.Peanut's ashes are in his memory box, as are several mementoes. His paw print is beside a beautiful photo of our brave little man. He faced many difficult challenges over the years, but hopefully we were able to give him the life that he so deserved. Peanut's anxiety had given way to a love that we will forever cherish. We are so blessed that this brave soul allowed us into his world. Rest in peace sweet Peanut. We love you.